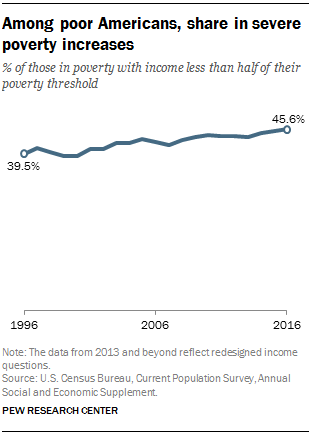 Although the overall U.S. poverty rate declined and incomes rose rapidly for the second straight year in 2016, many poor Americans fell deeper into poverty, according to a Pew Research Center analysis of U.S. Census Bureau data. The official poverty rate was 12.7% last year, close to its pre-Great Recession level (12.5% in 2007). This represents 40.6 million people in poverty. But categorizing people as below or above the poverty line is just one way of looking at economic well-being. Poverty thresholds, which are used by the Census Bureau to calculate the U.S. poverty rate, vary across families. The Census poverty thresholds in 2016 ranged from around $12,000 for a single-person family to around $25,000 for a family of four, and higher still for larger families. In comparison, the median household income for all households was $59,039 in 2016. For family households only, median household income was $75,062. As the share of poor families in severe poverty increased in recent years, these families also saw their incomes fall further below the poverty line. The average family income deficit – that is, the amount a family’s income is below its poverty threshold – was $10,505 for all families in poverty in 2016 (excluding individuals living without other family members). After years of gradual increases, it marks a recent high, up roughly $1,000 from 2000 when the average deficit was $9,509 (after adjusting for inflation). Among poor families, the average income deficit was largest for those led by a woman with no husband present ($11,139), compared with $9,991 for married couples and $9,288 for families led by a man with no wife present. 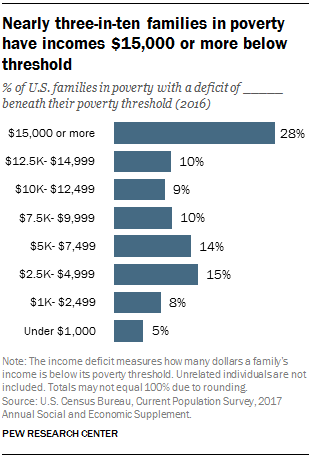 As the average income deficit increased, the share of poor American families living far below the poverty threshold also grew. In 2016, 28.4% of families in poverty had incomes $15,000 or more below their poverty threshold, up from 26.2% in 2015. Nearly 2.3 million families had such severe deficits last year. The Census data show a different trend for American families who were not in poverty in 2016. For the vast majority of these Americans, the average income surplus – the amount a family’s income is above its poverty threshold – was at least $15,000. The share of families above poverty with a surplus at least that large has gradually ticked upward in recent years, from around 84% in 2010 to 87% in 2016. Married-couple families above the poverty line had the greatest income surplus, with an average of $97,249. The average income surplus was roughly half as large among families led by a woman with no husband ($46,026). Male-led households with no wife had an average surplus of $62,680.